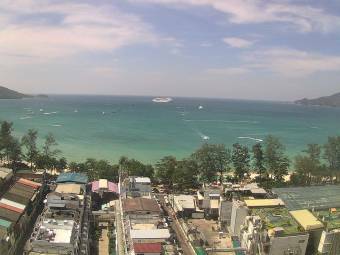 Webcam Patong Beach (Phuket): View over Patong Beach - In this Patong Tower Condominium for rent, the tallest building in Phuket, the operator offers rental of this luxury holiday apartment on the 15th floor. It's fully furnished with a large bedroom, living room, kitchen, dining-room suite, bathroom, high speed ADSL and all modern conveniences. From the nice balcony you will have a stunning sea view to Patong Beach. Prime location – a few minutes walk to the center of the town and the new shopping center. Perfect for couples and people who enjoy life. Patong Beach (Phuket): Bangla Road - Bangla Walking Street, 0.2 mi. Patong Beach (Phuket): View over the Beach, 0.2 mi. Patong Beach (Phuket): Baan Laimai Resort, 0.2 mi. Patong Beach (Phuket): Phuket Graceland Resort & Spa, 0.8 mi. Patong Beach (Phuket): Dolphin Circle, 1 mi. Patong Beach (Phuket): Diamond Resort, 1.2 mi. Patong Beach (Phuket): Patong Lodge Hotel, 1.3 mi. Kalim Beach (Phuket): View over Kalim Beach, 1.5 mi. 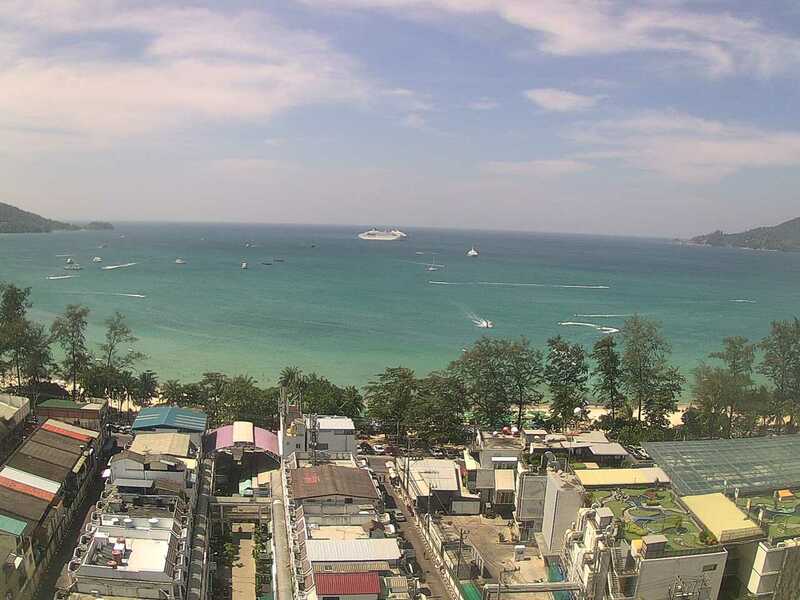 This webcam Patong Beach (Phuket) with the theme Seaview was added on March 14, 2014 and is operated by Patong Tower Vacations. It got 22982 visitors since then. Shouldn't this webcam work or should the link be wrong please report that here. You can add this webcam here to myCams.